CHECK OUT MY DEVIANTART JOURNAL HERE! 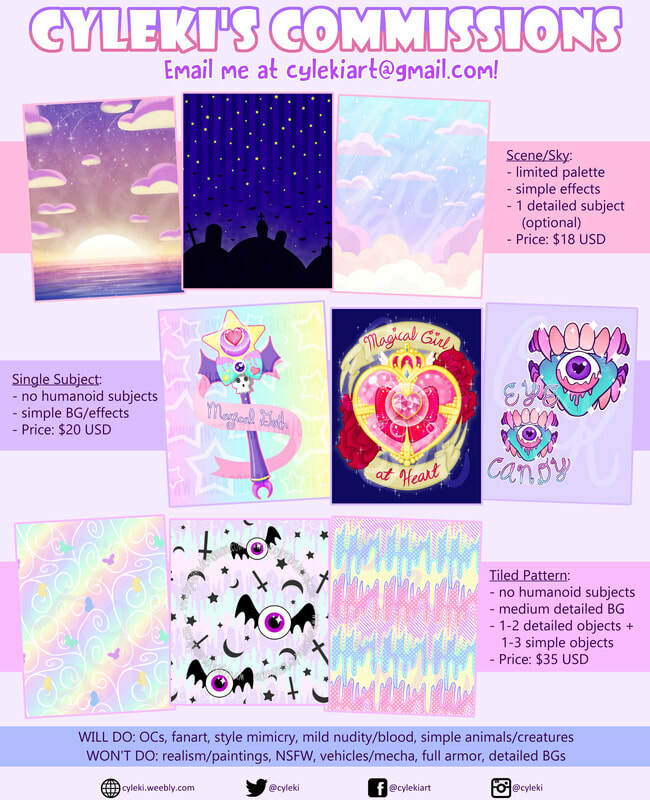 OR JUST EMAIL ME AT CYLEKIART@GMAIL.COM! SIMPLE SCENE is a limited palette scene or sky with optional simple effects and/or single detailed subject. Samples can be found here and here. SINGLE SUBJECT is a single non-humanoid object with an optional simple background and/or simple effects. Samples can be found here and here. PATTERNS are tiled/seamless patterns with 1-2 detailed objects and/or 1-3 simple objects (but no humanoid subjects) on a medium-detailed background. Samples can be found here and here. ​Please read further for more information and terms of service. DEFORMED STYLE is a full body, full color character art, with optional simple background and effects. Character limit is 3. Samples can be found here, here, and here. Base Pricing (USD): $12 USD. $3 per each additional character. ANIME STYLE is a full body, full color character art with optional simple background and effects. Character limit is 2. Samples can be found here, here, and here. Base Pricing (USD): $20 USD. $5 per each additional character. SYMMETRICAL BUST STYLE is a full color character bust with optional simple effects. Backgrounds and additional characters are not available. Samples can be found here, here, and here. Base Pricing (USD): $15 USD. Please read further for more information and terms of service. Payments through Paypal only, however, I do take point commissions on DeviantArt, but discussions for those must be held there. Payment terms, deadlines, and copyright will be discussed privately, as they may vary on a case-to-case basis. More of my art can be found on my various social media accounts linked on the home page and on the contact page. If interested, any questions or comments can be sent through social media, the form on my contact page, or you can email me at cylekiart@gmail.com. 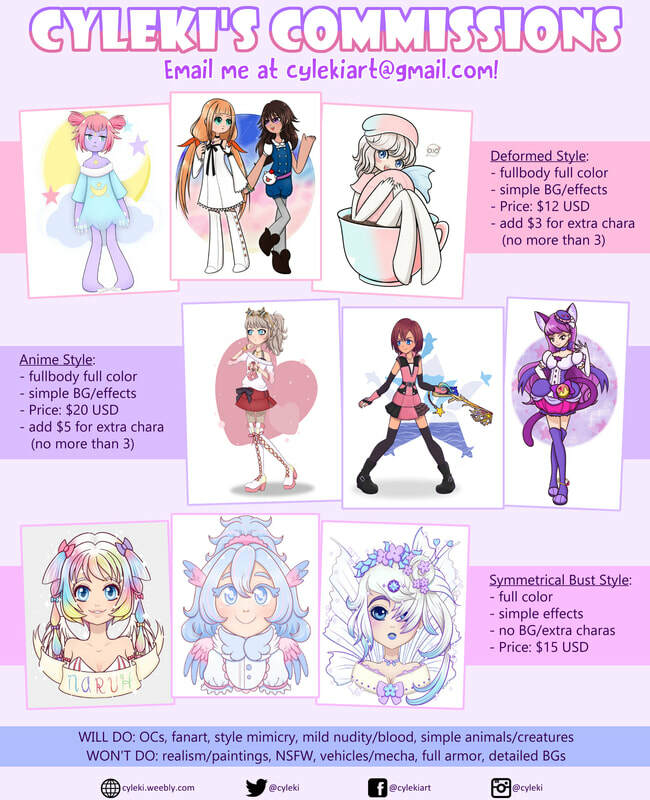 You send me your commission request, and we discuss the details. I give you a price estimate. If you agree to all my terms, I add to to my list and begin the sketch process ASAP. I send you a low-resolution WIPs during the whole process, giving you chances to change certain things; I will let you know what can be changed specifically at certain stages. One-on-one livestreams, public livestreams, Skype sharing, or Discord chat are options for faster feedback as well, but your contact information will need to be provided for these options. A final watermarked WIP for the finished work will be sent along with a Paypal invoice. When payment is confirmed, I will send you an email with the full-resolution work. Depending on the sharing terms discussed, your work will be posted to my various galleries and portfolios, and links to any accounts you would like to be notified on will be included. You may also post it to any accounts you have as well, provided that it doesn't violate my or site-specific ToS. I (the artist) reserve the right to decline any commission request without reason. I (the artist) reserve the right to use any commissioned work in my portfolios and galleries, both online and offline, on any of my current accounts or any I make in the future. I (the artist) reserve the right to adjust prices for individually commissioned work based on complexity; price increases will always come with a clear explanation. Commissioned work may only be reuploaded by the client to the client's account(s) with proper credit to me (the artist); this includes my name and/or links to my website or gallery account(s). I (the artist) reserve the common-law copyright to all commissioned work produced, and such work may NOT be mass produced to be sold for profit, redistributed, or otherwise used commercially without my explicit consent. Any work made for a client may NOT be edited or altered in any way without my (the artist's) prior consent. The ONLY exception is if the client wishes to color a lineart work they have ordered from me. All signatures featured on any work MUST remain intact unless discussed privately with me beforehand. Commissioned work may only be used by the client for personal use, such as original character profiles, avatar icons, desktop wallpapers, forum signatures, or theme layouts for Tumblr blogs, Gaia profiles, Deviantart pages, personal websites, etc. The client may NOT claim any work as their own. Furthermore, any design art that I (the artist) make will not be used by me for anything other than portfolios, unless the client privately discusses as much with me. Additionally, the client may ask that the work not be posted publicly at all if they so wish. Cancellations may be issued any time before the work is complete; however, the client will not receive any WIP work that had been completed prior to issuing a cancellation. Furthermore, cancelled work will not be posted on any of my (the artist's) online portfolios or galleries, but parts may be reused for future projects. Due to the payment being issued after the work is complete, the client may not request a full refund; however, a partial refund, up to 50%, may be issued after the client discusses as much with me (the artist).